Unlike most video games, which get complete artist freedom when creating their world , Far Cry Primal’s world is based off historic regions and tribes that existed over 10,000 years ago. Game developers, Ubisoft, truly wanted to make an authentic world for Far Cry Primal so they hired a team of historians, anthropologists, and linguists to work alongside developers and voice actors. The result is an immersive world that will blow players away. So here are the 6 reasons why Far Cry Primal’s world will submerge gamers into the prehistoric world. With the Ice Age ending, the Ubisoft team wanted to their world to look verdant and a full of life. The Carpathian Mountains were an ideal location because of its diverse wildlife and natural resources. It was a perfect region to settle, and to fight over. As players explore the land, they will get a sense of why it was so valuable for prehistoric humans. Adding to the game’s authenticity, Ubisoft brought in historians and anthropologists so they could recreate ancient tribes from Mesopotamia, Western Europe, and Asia. In a behind the scenes video, the team mentions that “Players will encounter many different human tribes. Each of these tribes depict an important branch of prehistoric humanity, and each carry their own culture and set of beliefs.” interacting with these tribes will not only immerse players, but also give them a sense on how humans lived during this period. It wouldn’t make much sense having prehistoric humans speaking English or Spanish. So the team hired linguists to create a new language based off of Proto-European. The language is what prehistoric tribes used, and is the basis for many modern and ancient languages. Below you can see the language in game. The voice actors for Far Cry Primal did much more than simply memorize lines. They had classes and training exercises so that they learned multiple versions of the language and understood its meaning. 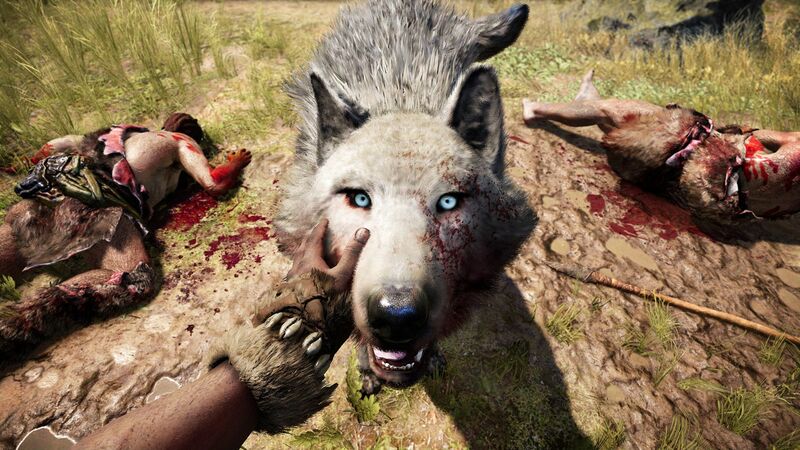 While animals are nothing new to the Far Cry series, Primal is giving them a more important role. Players need to hunt animals for supplies, which can be used for upgrades. Animals can also be tamed to help you track down other animals, or used to ambush humans. Animals were essential to prehistoric humans and Primal drives that point home. Looking for Far Cry Primal T-Shirts? Look no further! This is all fair and good to a point, but there’s missing a big chunk of authentic human behavior 10,000+ years ago which oddly enough is similar to human behavior now.